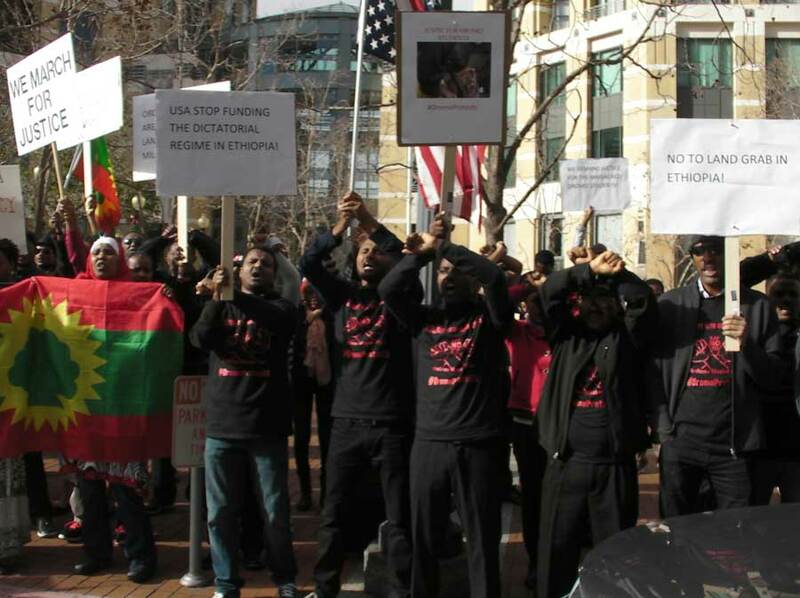 Oromo protest in Oakland, December 2015. Credit: Oakland Institute. For months, this crossed-arms symbol has been at the forefront of protests across Ethiopia, demonstrating peaceful resistance in a country that kills or jails anyone who dares criticize the government. Between November 2015 and January 2016, over 400 people – mostly students – were massacred by Ethiopian government forces while protesting a proposed "Master Plan" that would take away people's land to expand the boundaries of Addis Ababa.1 Earlier this month, peaceful protests were again met with state violence, with at least 97 killed, hundreds injured, and thousands detained. This violence by the government is meant to silence dissidents and rule the country with an iron fist. But the government strategy has backfired as repression has ignited a national struggle for democracy and human rights. With the Master Plan now on hold, this month's protests were directed at the government itself. Oromo leaders say that their protests are about fighting for rights. And there is so much to fight for. In the past two elections the ruling EPRDF party won 99 and then 100 percent of the seats, amid massive crackdowns on opposition party members. World Bank funding for basic services was diverted and used to displace and abuse indigenous communities while paving the way for land grabs in Ethiopia's Gambella region. Journalists, students, land rights defenders, religious leaders, and opposition party members have been routinely arrested and charged as terrorists under the country's draconian Anti-Terrorism Law. Human rights organizations have been decimated as a result of the country's Charities and Societies Proclamation. Thousands have been arrested, detained, or disappeared for their vocal opposition to the government. Journalists have fled the country or are behind bars. One might think that the international community – which provides the Ethiopian government with nearly US$4 billion in development aid annually – would take a stand on this abhorrent situation. And indeed, some have. United Nations Human Rights Commissioner Zeid Ra'ad Al Hussein rightfully condemned the violence, urging Ethiopia to allow international observers into the Oromo and Amhara regions. The government authorities, unsurprisingly, immediately dismissed the request. But Ethiopia's closest allies and donors – the World Bank and countries like the US and UK – are noticeably silent. A brief comment by the US Embassy in Addis Ababa in August 2016 said the Embassy was "deeply concerned" by the violence, and expressed condolences to those who suffered. The statement then pointed out that the demonstrations happened "without authorization" and suggested "constructive dialog" as the way forward for those seeking redress. This response is absurd and inadequate. The Ethiopian government routinely cracks down on the universal freedom of assembly and arrests those who challenge or critique government. The list of charges against student protesters from March 2016 is one small example, with criminal charges including conducting a peaceful rally and voicing opposition of the Ethiopian government's Anti- Terrorism Proclamation, a law denounced by international lawyers and human rights experts. Asking protesters to obtain authorization for protests and engage in constructive dialogue with a repressive and violent government is at best naïve and shamefully ridiculous for anyone with an understanding of the current political situation in the country. The US government has a moral obligation to take a stand and denounce state violence in Ethiopia given its prominent role in the country. In 2014, US development aid to Ethiopia totaled approximately US$665 million, making it the single largest country donor, and second largest donor overall, after the World Bank. Every year, the US gives Ethiopia around $800,000 in military financing. Allowing such outrageous human rights abuses, without condemnation is appalling. It signals that violent repression is permissible and that there won't be consequences. With hundreds of lives lost already, and reports suggesting that Ethiopia could descend into civil war, we must ask: how much blood will be shed before the US will stand up for human rights in Ethiopia?